Nothing new to see here folks, the country still buzzing over Jack Warner's sound beating of Ashvani Mahabir at the UNC Internal Elections. 12,000 votes, and in his own inimicable style, Warner has promised to find the 14 people from his constituency who voted against him and try to meet their needs. Of course Warner's win has sparked off conversation about whether the UNC is a post-race party....a term that's being bandied about loosely. But until the UNC stops treating with Trinidad andTobago as a bi-racial country, until they stop acting as if the only two ethnic groups living here are Africans and Indians, then I can't consider them anything but "racial" in how they approach the politics of the country. Please note the use of the word racial, as opposed to racist. Like governments before them the tendency is to focus on only the two major ethnic groups of the country....very few people acknowledge the many other ethnic minorities that live here....and until the UNC moves away from their bi-polar/bi-racial approach to national politics....they aren't post-race.....and the party really isn't a viable option for the many people in the non-Indian demographic. Many non-Indian supporters of the UNC will actually tell you they are COP who just want to see the back of the PNM. In light of the low voter turn-out, one wonders if this internal elections is something for the UNC to be proud of. The UNC is the major party of a govt coalition, and on a Saturday, a day that allows people enough flexibility to slot in the time necessary for voting, didn't vote. The election was plagued with irregularities, yet both Warner and Moonilal have been talking about the party's integrity, transparency and generally saying that the elections were a success for the party. I'm not so sure....and whether it's sour grapes or not, at least Fuad Khan had the good grace to note that 80% of the party's support base rejected the party over the weekend. 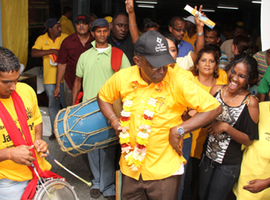 And it seems that even David Manning, son of former PM Patrick Manning, was overwhelmed with joy over Moonilal's victory as Deputy Political Leader of the party. Moonilal insists that the young Manning is not being poached by the party...it really would make little difference to the party's or Manning's credibility if you ask me. So, Marlene won, and I feel quite certain that this lady's political ascent has only begun. Keep an eye on the Coudray folks, from troublesome mayor, to troublesome COP member, too...follow where I going with this...keep an eye on it. I still find it hard to understand how after joining the party a week away from its internal elections Marlene managed to drum up over 7000 votes....are we saying that UNC members vote for slates and not for the policies and values that the individual stands for? 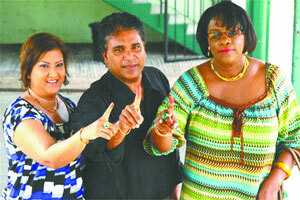 The greenpaper on Self Government for Tobago is out. The AG, who we aint hear from in a while, couldn't resist pointing out that the PNM didn't consider this in 2010...and that the PP making good on it's manifesto promise of 2010....I'll wait to hear Orville's word on it An&, especially since the last I heard the paper not really in the interest of Tobagonians at all. Permanent Secretaries came under fire in Parliament on Friday and I and all wondering what responsibility if any do these people have to properly managing our government? Should the state abuse of public funds we've been seeing under this regime and other actually fall into their lap of responsibility? And the latest on the strike is that TCL, 5 weeks into strike action, is on the verge of financial collapse. How did that happen....how can 5 weeks of strike cripple a company this bad, unless it was being mismanaged before? 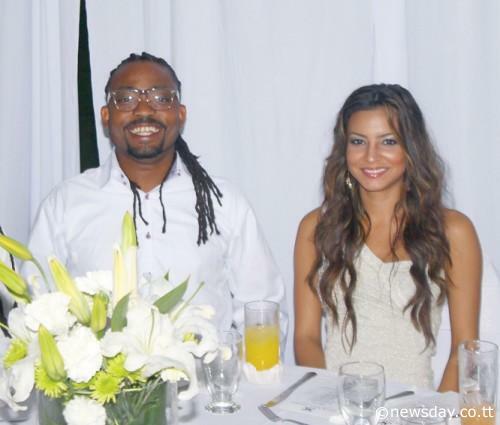 And finally, Machel could stop hugging up he "boddle of rhuummm" and hug up Kavelle and give thanks for his many victories this year....and we looking forward to the HD remix of the Wedding March...Heh HAAAA! The week now start folks...it early yet.